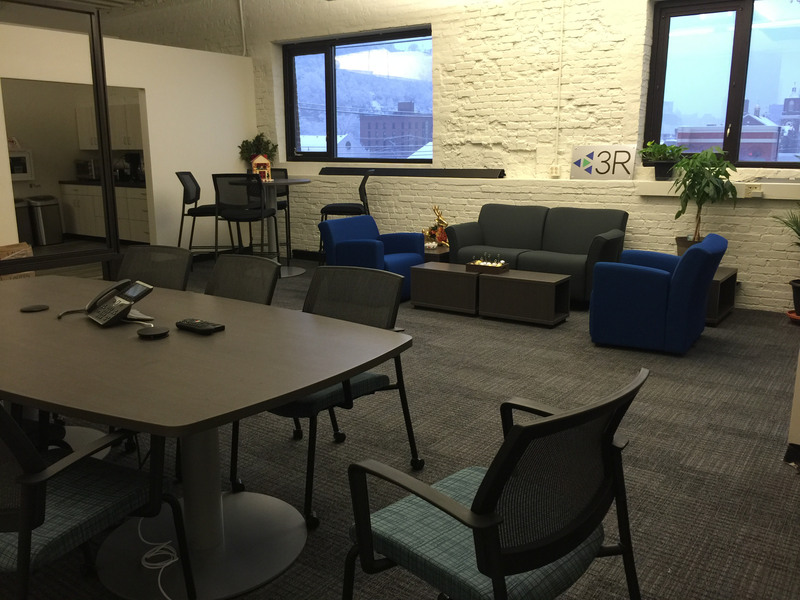 Over the past 18 months the 3R Sustainability team has grown to the point where it became necessary to consider a new office space. The team’s objective early on was to find a location in the heart of the city that is close to many amenities and close to public transportation. With several options at hand and the philosophy of sustainable buildings in mind, the decision was made to relocate to an existing building in the Strip District of Pittsburgh. Relocating into an existing building has the advantage of having fully developed infrastructure available, affording a connection to the history of the city, and reducing the impact that the construction of a new building would have on the environment. The layout of the new office space was formed by an intent to allow for flexible work situations; height adjustable desks and ergonomic chairs foster healthy work habits while informal seating areas and a collaboration room allow for breakout sessions and the ability to “get away” from the desk for a while. The south-west wall of the office is pierced with windows offering a beautiful view of the city. As a consequence, the conference room was located on the opposite wall to allow natural daylight to filter into the work space. The original brick walls remain exposed as well as the ceiling structure above to keep as much of the character of the building as possible. The result is a pleasant and bright office environment that is conducive to productivity and which reduces the consumption of energy and water. The office location allows the occupant to use alternative transportation options and walk to a variety of business in its neighborhood. 3R Sustainability is proud to not only have a new office that connects the team to the history of the city but also to reduce the environmental impacts that an office move generates. It has been a long-standing belief within the company’s culture to foster healthy behaviors by organizing regular walks during the work day, offering healthy foods such as fruits and vegetables on a daily basis, and organizing various programs throughout the year that increase the individual’s health and well-being. In addition, 3R Sustainability now offers the team an environment which promotes the health of the occupants by focusing on low-contaminant products and materials, by offering a sense of place within the fabric of the city, and by reducing its energy and water use. In March 2017, the 3R Office was awarded LEED Gold v2009 Certification by the USGBC. See the complete case study on the 3R Office certification.